Jabin, my son, hears a knock on the door which startles him. He looks to me with wide eyes and runs into my arms. I pick him up, whisper in his ear that he is known, safe, and loved, and open the door to see his dad, Kyle (who shared previously on ICP’s blog about our adoption journey). Jabin bursts out a huge smile and leaps into Kyle’s arms. This story displays aspects found in the theory of attachment, which I was intrigued by in my Master’s program of Marriage and Family Counseling. Attachment theory in a nutshell is this: from the earliest moments of our lives we bond with those around us, especially to our mothers and fathers (people who are primary attachment figures). How we bond with them at our earliest ages has a strong indication of what our adult attachment will look like. We either have secure attachment (if our primary attachment figures showed us that we were known and loved), or one of three types of insecure attachment. Here are four stories that explain the different attachment styles that exist. (Securely attached) Sierra had a loving and nurturing environment when she was a kid. Her mom and dad gave her opportunities to grow in her independence but were present when she was afraid and uncertain about exploring new things. She believes that there is good in her and that the world is good (while understanding there are exceptions and boundaries). (Insecurely attached) Ivan’s parents neglected him. He fought for their attention and now as an adult never wants to be alone and over-shares his feelings with anyone who is around him. Without realizing it, he believes, “I am bad, and the world is good” (anxious - ambivalent attachment). (Insecurely attached) Ian always moved around as a child, never having a secure set of friends and his parents were immersed in their jobs. He learned to not rely on others, has very few people who actually know him, and subconsciously believes,“I am good, the world is bad” (anxious - avoidant attachment). Finally, (insecurely attached) Isabel was raised by a single parent who died when she was 7. Her uncle got custody of her and abused her. As an adult, she pursues people by sharing intense details of her life even to people she just met, but never lets people become friends with her. She subconsciously believes, “I am bad, the world is bad” (disorganized attachment). The essence of this theory is integral to adoption, which is dear to my heart. Learning this made me cautious about adopting, even though I felt a strong call from the Lord to do so. Was I ready to encounter, love, and care for a child who has experienced intense trauma? Was I even capable of modeling secure attachment to them? I knew I would not be a perfect parent (and that has definitely proven true! ), yet secure attachment does not require perfection. It requires humility that is found ultimately through Christ’s power alone working in me. 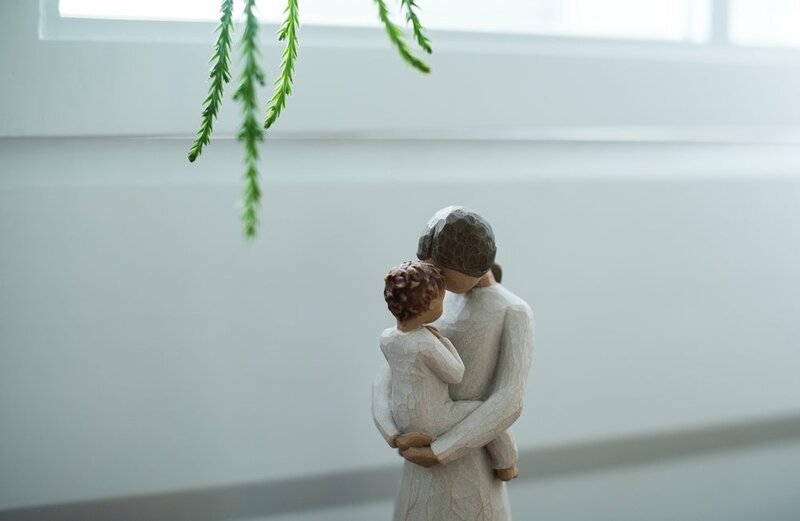 Even though one’s attachment style is largely based on the attachment they received during their first two years of life from their primary caregivers, attachment styles can change - by having loved ones model secure attachment behaviors! Jabin’s attachment since coming home 6 months ago has blown us away! He immediately attached well to us- he comes to us in his need, yet explores and adventures beyond our arms. I give the credit to his foster mother. The safe space she provided him for his first year and a half of life has paved a foundation of trust for Jabin to enter into trusting us. Yet I find myself asking this question about Jabin’s behaviors continually, “Is this behavior a typical, developmental behavior, or is it an outflow of his trauma?” Sometimes (most times, if I am being honest) I am not certain. Yet, when I employ loving techniques to show him grace with boundaries rather than physical punishment (which can instill fear, the opposite of trust) when he is doing something he is not supposed to, I see him grow to trust me more and he even (sometimes) stops the negative behavior! I must add that Jabin’s attachment process has been unique. Many children from hard places who have insecurely attached to their caregivers will model behaviors like co-sleeping for many months post-adoptive placement, showing manipulative behaviors, or having issues with either food, bowel movements, or sleep (all these are ways they attempt to control their environments and feel safe because they have not felt safe previously). But as I mentioned before, all is not lost! Once you begin to see beyond the behaviors and see into the attachment needs your child has, then you are able to empathize and seek to grow in your bond with them. Trust Based Relational Intervention is a great resource for these techniques and has been a sanity saver for us! Parenting is difficult, no matter how your child came into your family. Understanding our own attachment styles as adults and praying that the Lord would grow in us a secure attachment with our children is humbling. I am excited to be on this journey with the ICP community! Marcia Post is a wife of 6 years to an incredible man of God and a mother of 6 months to a sweet (and strong-willed) 2 year old. She graduated with her Masters degree in Marriage and Family Counseling from Asbury Theological Seminary in 2017. She has worked with the missions organization, Cru, for 6 years where she disciples college students in Louisville and makes disciples of all nations through the power of the Spirit.